The cats listed below have now found permanent loving new homes. Sammy was surrendered to DCH at the age of 4 just before Christmas last year. 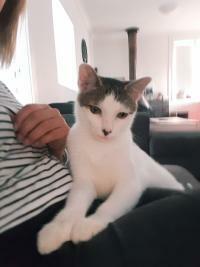 He is a very friendly and smoochy cat with his humans, but also loves dogs and is brilliant with his permanent and foster feline friends, too. He has proven to be a very adaptable cat, and would no doubt love to find a family with other kitties or cat-friendly dogs to play with if possible. Sammy is also used to being an indoor/outdoor cat to date. Sammy particularly loves to rub up against members of his foster carer family, but generally prefers to sit beside them rather than on them, which is a bonus in summer time! Like many cats, he’s not that keen on being picked up. But he hasn’t a mean bone in his body, so will always point that out very politely. If you have room in your heart and home for Sammy, he would love to meet you at his Glenhaven foster home. Sammy is already de-sexed and microchipped, and is up to date on all his vet requirements. His adoption fee is $125. He looks forward to meeting you soon at his Glenhaven foster home. 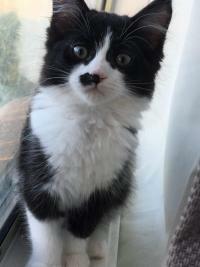 Fitz has a gorgeous black and white medium-length coat which is quite fluffy and will need brushing from time to time. Fitz is in foster care with his siblings, Frodo and Freya, along with a tabby called Franki. Fitz is a funny little fellow who pretends to be independent until he thinks he's missing out on fun or cuddles! He has a very soft purr when he's happy, and whenever he's eating! Although he seems reserved at first, it doesn't take him long to jump into the action. Fitz is looking for an Indoor Forever Home where he will be safe and loved. He is litter trained and loves to find a quiet sunny spot for a nap! If you would like to meet Fitz, please give me a call to arrange a visit! Kalila arrived in care with her two siblings. 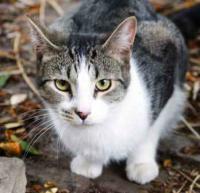 She is friendly, active and inquisitive, and she loves to wrestle with her brother, Zippy. Kalila is a sweet, gentle personality; she will make a great companion to a loving family that will keep her safely indoors only. Kalila is in foster care 5 mins from Penrith, NSW. She is litter-trained, microchipped, vaccinated, and up to date with flea and worm treatments. Please contact her foster carer if you'd like more information or to arrange to meet this gorgeous girl. The beautiful Cuddles, now 4 months old, was rescued from the street together with her sibling just after Christmas, and has since thrived in DCH care. Although initially a little shy, Cuddles now gets along famously with her carer’s children, and shows lots of love and affection to whoever she meets. True to her name, she is the cuddliest snuggle bug there is. 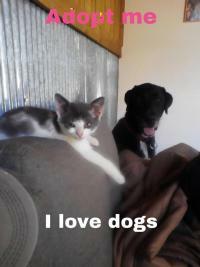 She also lives happily with the resident cats in her foster home. Cuddles just demands you give her love and affection by rubbing her head on your leg, arm, and even sometimes your face… until you give in, sit down and pet her until she has had enough (which is never). 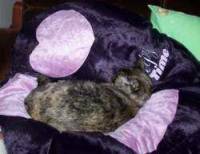 She does also like to play with her kitty sibling, but is a mellow girl who would rather cuddle and sleep under her humans’ chin, or on a shoulder or lap. As she is well socialised within a family, Cuddles would be suited - and is sure to bring much love - to a furever family. Equally, she will make a great lap cat for a single or couple. She is an indoor-only kitty. Cuddles is microchipped, vaccinated and already de-sexed. Her sister has just been re-homed so it’s definitely time for her to find her own permanent home. If you’d like to arrange to meet the lovely Cuddles at her Schofield foster home, please call Daphne on 0416 421 870. 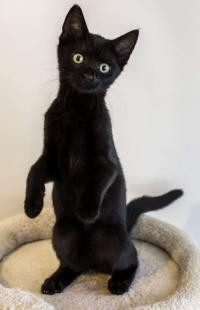 Middy (Midnight) and her 3 siblings were rescued from the local pound where they were handed in as strays. 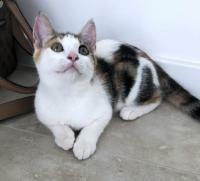 She has settled in well and is a very content little girl that loves to play and wrestle with her sisters. 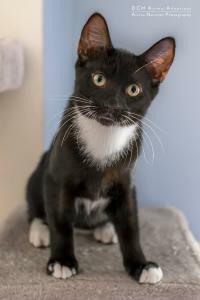 Middy is friendly, affectionate and playful, and, like most kittens, she is a little shy when meeting new people but will quickly adjust in her new home. Middy is in foster care near Penrith, NSW, and is ready for her new home now. 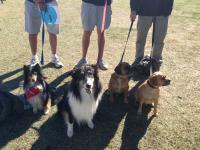 She is litter trained, microchipped, vaccinated, and up to date with flea and worm treatments. Middy's desexing is included in her adoption fee. Please ring or text her foster carer if you'd like more information on Middy. 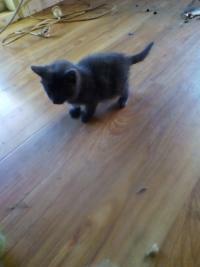 Ninja was rescued from a gutter in Penrith with his brother, Popeye. He is currently between 5-6 weeks old, so is still a bit too young to be adopted but would love a meeting with his potential new family! Please call Rod, his foster carer, to organise a meeting. 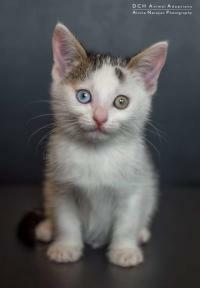 Popeye is a little boy rescued from a gutter in Penrith with his brother, Ninja. He has really big lovely eyes, so hence his name! He is living with both dogs and cats, and gets along with them all, you can see him in the background behind his playmate the wolfhound! Popeye would love a meeting with his potential new family! Please call Rod, his foster carer, to organise a meeting. Peter was born in DCH foster care to Mumma Polly Pocket who was rescued from the pound. This kitten has been raised by Polly Pocket under the care of a foster carer. 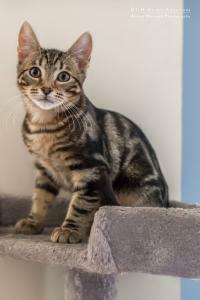 Peter is a stunning kitten with a lovely shiny coat. He is very active and loves attention. He loves to play games and to interact. 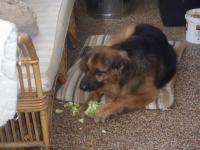 He is best suited to a home with kids that can play with Peter and keep him entertained. He can be a little bit flighty to new people and new sounds but usually adjusts pretty well. Peter will allow you to hold him upside down on his back and stroke his neck and chest. He has a very lovely loud purr. We are looking for a strictly indoor home for Peter. Peter’s sister Georgie Girl is also available for adoption and they could be adopted together. There is a little bit of medical history to be aware of which has affected George Girl more than Peter so please ask to speak to the foster carer to get the background information for your awareness. Peter loves eating his Advance Kitten dry food and will also eat 1 meal a day of kitten wet food. Peter will also eat the occasional boiled shredded chicken. He uses the litter perfectly and is on crystal litter. Bobby is my beautiful bobtail foster baby, who came into rescue at just a few days old. He was much smaller than your usual size kitten, therefore a lot more sensitive, all is well now and he is an extremely confident and playful kitty. Bobby likes to walk around the house as though he is boss, he is not shy at all and loves playing with my dogs (especially the large dog). He is very cheeky around the rabbit, maybe a little too cheeky. Bobby loves to play a lot, so if you have kids and/or you can give him the attention he needs, he will love you for it. He will come to you for affection and likes to make sure he always knows where you are, on guard at all times. He has an obsession with jumping out in front of you and running off to then come and grab your ankles for a quick nibble (very cheeky). He loves to run around the house with his toys in his mouth, or will grab the toy you throw for him and bring it back. Overall I have watched Bobby grow and if I had a bigger house and more space, I certainly would have kept him. Please feel free to ask any questions and you are welcome to drop by and meet him.